← KOPi USB Power Strip Powers It All UP! The custom USB contains 35 studio albums, 6 live albums and a lot of singles. Rumor has it too that it even includes digitally re-mastered version of some of his most popular works, which includes songs from his albums: Self Portrait (1970), Pat Garrett and Billy the Kid (1973), Dylan (1973), Hard Rain (1976), Street-Legal (1978), At Budokan (1979), Saved! (1980), Real Live (1984), Empire Burlesque (1985), Knocked Out Loaded (1986), Under the Red Sky (1990), Good As I Been to You (1992), and World Gone Wrong (1993). All audio files are in both MP3 and FLAC lossless formal. 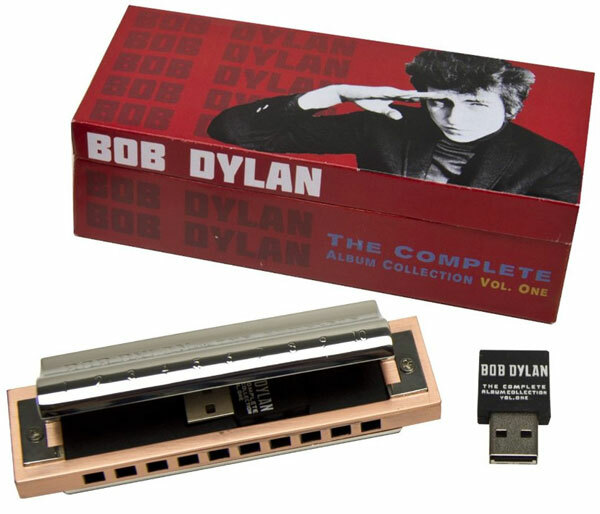 Aside from the songs in the “Bob Dylan Complete Album Collection Volume One”, the custom USB has a pretty neat design, too — it is shaped like a harmonica! Plus the songs have been arranged in an easy to search format specifically made for mix tapes and custom playlists. The custom USB will also contain a digital version of the hardcover booklet plus some rare photos. If you are interested in getting the custom USB with Bob Dylan’s album, you better start saving as early as now. This harmonica-shaped USB comes with an incredibly high price tag of $364. But better get it now. With the millions of fans of Bob Dylan, this baby is sure to be gone in a blink of an eye. You can pre-order the limited edition harmonica USB set on the Official Bob Dylan store today. But wait, don’t stop saving just yet. Volume two of the Bob Dylan album is said to be released next year and sources say that it will include the “Bootleg Series” material. This entry was posted in Custom Shaped USBs and tagged bob dylan, Custom USB Drive, harmonica shape usb, USB Flash Drive. Bookmark the permalink.